We work in a complex and changing commercial world. In this environment, the value of authentic leadership has never been more important. Globally there is talk of a technology-revolution that threatens to change the shape of business as we know it. The role of leadership, is to cultivate environments that not only drive high performance but also to build resilience, increase agility and respond to rapid market disruption. To front foot these changes, as leaders we need to understand and harness the value that humans bring. Are you Ready to Lean In and Lift Up? For leaders, this means gaining self-awareness and the ability to show-up with authenticity. The NPG Two-Day Leadership Intensive was developed to equip leaders to better respond in this time of increased pressure and commercial uncertainty. Drawing on Neuroscience, Behavioural Economics and Positive Psychology, the NPG Two-Day program equips leaders (emerging and current) with brain-based tools to shift from a reactive to proactive state of self-leadership and by extension, leadership of others. Applying a brain-based approach to relationship building, engagement and setting organisational cadence. The neuroscience of cognitive complexity, which gives rise to a roadmap for cultural maturity. Leveraging performance networks (centered around key deliverables, which determine the degree to which organizations can deliver on mission-critical work). Applying insights from neuroscience to break through cultural resistance. Maximizing innovation hotspots and resolving blockages and pain points. Modelling and bringing out desired innovation behaviour. Independent of the formal structure, an organisation’s performance networks underpin the delivery of all mission-critical tasks. However, these networks are rarely defined and often poorly optimised. Leaders who recognise and understand how to chart and improve the effectiveness of the organisation’s performance networks can significantly improve specific performance areas. 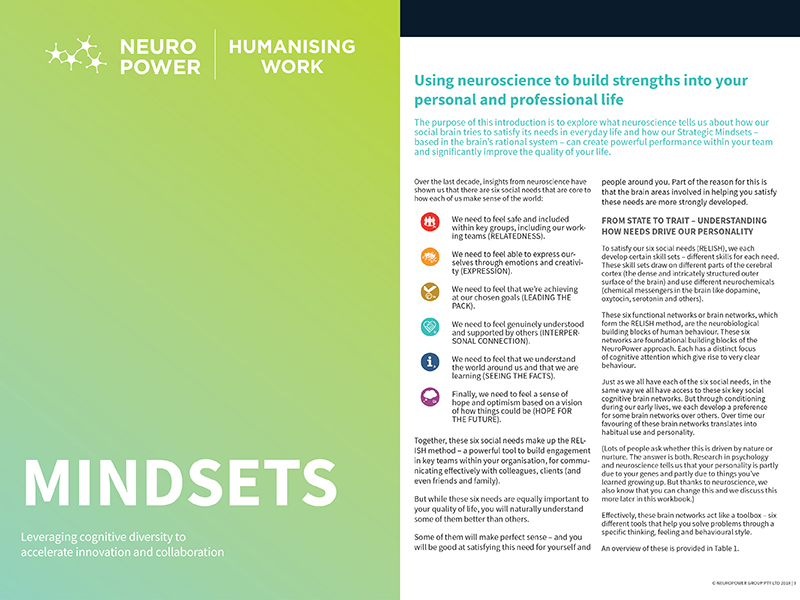 This requires a good working knowledge not only of how networks form and operate but also of the six social cognitive needs that underpin high performance cultures. With extensive academic research that has established the correlation between the satisfaction of these needs and desired KPIs, and a working knowledge of the neuroscience that sits behind them, leaders have access to a powerful lever to drive strategic outcomes. Swiss psychologist C.J. Jung said “Consciousness itself is the ability to recognise the difference between reactivity (System 1) and responsiveness (System 2)”. This is sometimes referred to as the Elephant (System 1) and the Rider (System 2). Understanding your Elephant and Rider, the Elephants that are sanctioned and reinforced by your culture, and the innovative Rider or mindsets that will the drive the change required, is critical for leaders to understand in a fast-paced and complex environment. Day 1 looks at the brain’s limbic system (System 1) and how it drives people’s reactions, perceptions and behaviour – including how they resist change, their triggers for conflict, what motivates them, their preferred communication styles and how they make decisions. Leaders can use this insight to drive their personal credibility and presence and effectively engage with others. Research by Keeley et al. (2013) has found that the more types of innovation a company uses the better it performs when benchmarked against the S&P 500 and that innovation comes in many different forms (business model, structure, product, channel etc.). A leader’s Innovation Mindset dictates the style of innovation they will prefer and the type of culture they foster to nurture this innovation.